George Palmer Highway (MD 704; now Martin Luther King Jr. Highway), about ½ mile east of US 50, Lanham, Md. The second of the two drive-ins (the first was the Super Chief in southern Prince George's) built by the D.C.-based Louis Bernheimer circuit; later operated by District Theatres. Located next door to a rod & gun club which, in the mid-'70s, held outdoor target practice on Wednesday nights. For some time after its closing it was used as a flea market. It's now one of a cluster of business parks along that sector of Route 704. Ironically, one of the park's occupants is a 1950s-themed restaurant called "Cafe 57". Click here for an interactive 1980 aerial photo of the drive-in (zoom in or out, or compare to older or newer photos of the same site). 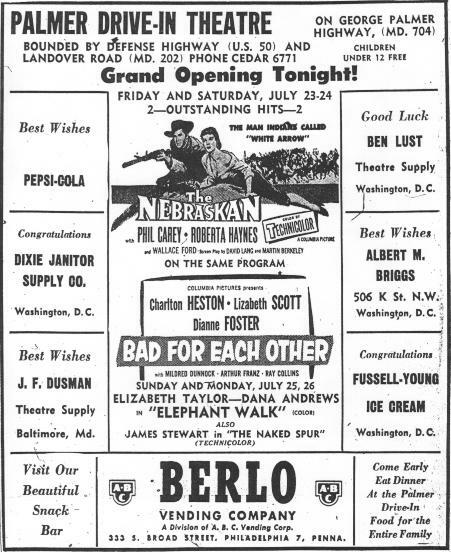 Below: the opening night ad from July 23, 1954.